Of course the best part about Thanksgiving is the leftovers. You know, now that I think of it, it doesn’t take me long to get sick and tired of turkey leftovers. Which is why this year we didn’t do a whole turkey. There’s just three of us and we weren’t having anybody over, so instead of a whole bird we just did a turkey roast. No no no, not a turkey “loaf,” gah, a roast. A turkey roast is basically a whole breast and some darkmeat - say about half a good sized bird - deboned. You cook it the same way as you do a whole bird, it takes about three hours. I don’t stuff a thanksgiving turkey anyway. I always make the dressing, as opposed to stuffing, in a separate roasting pan. I make my dressing with ground hot sausage and I want to make sure that it’s cooked all the way to 160F. If it’s inside the bird, the outside of the Turkey is usually dried out jerky by the time the middle is done, and the stuffing tends to absorb the juices and turn soggy if it’s inside the bird. So, I make dressing in a separate dish, and fill the inside of the turkey with a mirepoix of aromatic vegetables - celery, onion, carrots – and garlic, sage, and butter. In this case, since we were doing a roast, I packed the mirepoix and spices around the outside of the meat and covered the whole thing in foil. It worked like a charm and the resulting juices, mixed with cream, flour, parsley, spices, and white wine, make the best turkey gravy ever. The roast came out excellent and gave us just enough turkey leftovers for two or three days. Now I know what you’re thinking, Woot! Pass the mayo and the Wonderbread, it’s turkey sandwich time. It seems some folks just don’t know how to make a good sandwich. Start with flatbread. Add turkey and good Swiss cheese like Tillamook. Place in the sandwich press until the bread is hot and crispy. If you don’t have a sandwich press (and really, why don’t you? ), press between a pair of pre-heated cast iron skillets (don’t tell me you don’t have a pair of well seasoned cast iron skillets, you culinary Philistine). Open the sandwich and spread the inside with a bit of leftover cranberry sauce (you make yours from scratch, right?) mixed with an equal amount of cream cheese. Add fresh spinach leaves or a good dark lettuce such as romaine (no Iceberg, ever). Little salt and pepper. Eat while making nom nom nom noises. Leftover dressing on the side is optional. 2lbs hot ground sausage – Jimmy Dean will do in a pinch, better yet find a local artisan butcher shop that makes their own. The better the sausage, the better the dressing. 1 1/2 lbs of seasoned and dried bread cubes. Homemade or store bought, it’s stale bread, it really doesn’t matter. 1 cup turkey or chicken broth. 3 cups chopped celery and onion, sweated in olive oil or butter with 2 tablespoons fresh ground garlic until softened, and then allowed to cool. Sage, rosemary, thyme, basil, and cracked black pepper to taste - or rather to smell, I add spices until it smells right to me. But if you need numbers, say 1 tablespoon of the sage, rosemary, and thyme, 1 pinch of basil and black pepper. Mix it all together in a large mixing bowl. Make sure to break up the sausage into small pieces. It should be loose, not packed together, we’re not making sausage balls here. Place loosely in a large covered and greased casserole dish and bake at 350F for an hour and a half or until the middle reaches 160F on an instant read thermometer. Remove from heat. Now if you like the crunchy browned stuffing from along the edges, serve as is. Otherwise, stir inner to outer, and fluff with a large fork, cover and allow to sit for twenty minutes. 12 oz fresh cranberry berries, picked and washed. Mix it all together in a medium sized saucepan, bring to a boil, boil for twenty minutes. Mix with a fork, breaking up the berries. Remove from heat, transfer to a glass dish and allow to cool, then refrigerate until cold. We spent the rest of the day putting up our Christmas tree. You remember the Christmas tree, right? This year I bought a new ladder, one of those huge articulated Warner jobbers, that made setting up the tree a whole hell of a lot easier. Yesterday it snowed. Nearly a foot here at Stonekettle Station and I spent most of the day dealing with that and a dead truck battery. Today, my wife and son have gone off Christmas shopping, leaving me home to finish up a home improvement project by myself (damn right, leaving me home – no way in hell am I venturing out this weekend thankwewveddymuch, I rather do drywall or light my hair on fire). So, what are you guys doing with your long weekend? Okay, you put cranberry sauce on the sandwich. That means you're doing it right. But the cranberry sauce could use an orange or two, really. Long weekend so far spent either in the studio, where great progress is being made on the Project from Hell, or writing. We braved the freeways this afternoon to go look for a piece of furniture. I have the model I want, but I can only find it in this horrible shade of not-quite-yellow/not-quite-green that gives me nightmares. My dear, sweet husband found another store, which didn't have it in stock, but unlike the first store did have a set of upholstery swatches. Does anyone else play anagrams with the word verification word and try to come up with a real word using those letters? Spending the weekend setting up decorations, wrapping presents for shipping, and writing. Oh, forgot, sleeping. Starting to feel like a normal human again after three days of sleeping in. Put the tree up the day after, and finishing off the last of the turkey roulade (with home made sausage cornbread stuffing, sorry, cooked in what remained of the bird after surgery). Oh ya, home made pumpkin pie too, none of that canned stuff allowed in my house (except the mincemeat, not quite up to making it from scratch yet). Also, I have failed to own a sandwich press, but I was raised in southwest Missouri, so I own four cast iron skillets, and one large cast iron griddle. Food was great, and family was better. Stuffing for us is a turkey drippings delivery system, whether placed in the cavities or cooked with broth in a separate casserole dish. Since you put meat in your dressing, I can understand not wanting to bird it. This year we had some artisan loaves leftover from a special wine pairings dinner at Mrs. Dr. Phil's university, and they made great bread crumbs for the stuffing. The problem with company? The stuffing runs out too fast. Turkey Loaf??? oh, wait... Roast. Nice! I've been doing this since yesterday afternoon, rough turned the awesome blank I got from Jim, eating pie, playing with kittens, and drinking coffee. Hey cool, my word is Milla :) Think I'll watch 5th Element tonight and relax - with some pie - and a kitten. Dave just bought the Delta 46-460 lathe, because Dave doesn't have enough to do. 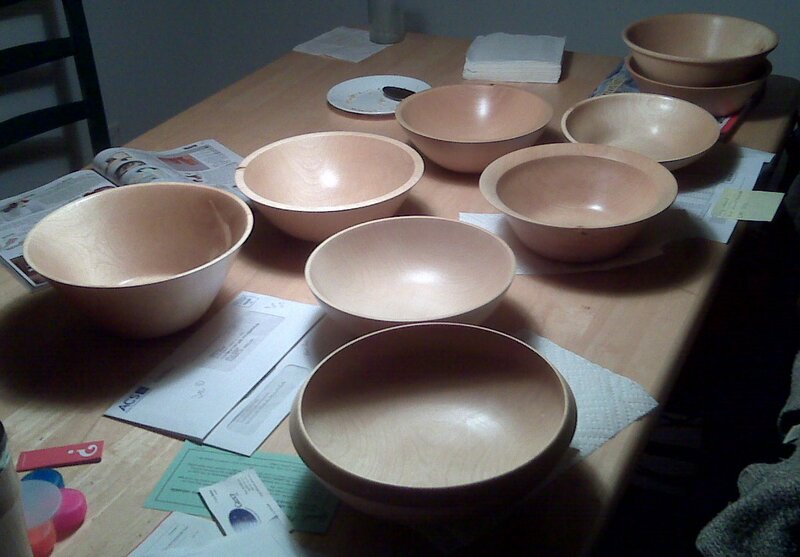 Who knows what evil (and by evil, I mean woodturning add-er obsession.) lurks in the hearts of men? I didn't buy the turkey until Wednesday and had the butcher cut it in half -- we were only cooking for the two of us and I figured it'd thaw out quicker that way. It wasn't thawed out in time for Thursday. No cranberry sauce -- that's some nasty stuff there! And I don't make anagrams out of the word verification - I try to figure out their definitions. xylogy: the act of playing a xylophone immediately after consuming a large meal--perhaps one with turkey and stuffing. Wow, you Americans are sure weird! Not only do you have Thanksgiving a month late, but you put sausage in the stuffing. Very strange. The real way to make stuffing is of course with bread crumbs in the cavity of the turkey. And the best way to prep the turkey is to de-bone it. That way the spices in the stuffing can interact with the bird and the flavours from the bird can interact with the turkey. Try to get it right next year, eh? After we got back from the furniture viewing expedition, the husband, son, and I looked at each other and said "We need a break from turkey!!". So we made reservations at Roy's Hawaiian and had ribeye, filet, and squid, respectively, for our dinners. Squid is soooo yummy. I love whatever upswelling of strange waters off of the California coast that has led to an overabundance of squid for our delectation. Today, back to turkey. I'm contemplating turkey pot pie for dinner. My word, gadrid, is probably a town in Spain, or an anagram of giddar, which has to be a word for a stringed musical instrument of some sort. Sausage in the stuffing and Tillamook cheese on the sammy. Trust me, not all Americans put sausage or chestnuts or water chestnuts or whole squab in their turkey stuffing. terprei -- a city on Taiwan named after the local giant tortoises. Let's see, turkey with the family- at a restaurant. My 5-month old nephew was passed around even more than the coffee-flavored cheesecake. (High point- my stepsister holding the baby as if he were an about-to-explode grenade). Followed by Friday at a museum and going to see New Moon with a couple of teen-aged nieces. Off to the gym today- time to work off the weekend's excesses. Sandwiches, that is so Palin. Take 10 pounds of left over turkey, white and dark meat, and cut off the bones. Save the bones for stock later. 3 pounds home made home smoked andoulli, 3 pounds home cured dry cured ham: make a gumbo. Portion out enought for two for lunch and add a 1/2 pound shrimp. Tabasco to taste. Thtat is what to do with left over turkey.